Classic-style elements, principles of Interior design, furniture arrangement are for centuries used in various interpretations. They are transformed, flow from one to another under the pressure of fashion and public mentalities. And what was quite acceptable in one era may wrongly explained in another. Gilded stucco moldings, entirely appropriate in the palatial interiors, are not always acceptable, especially in large quantities in modern apartments and houses. It is difficult to create palace interior in a pantry, likewise, to squeeze into small spaces Classic canons and airspace décor. 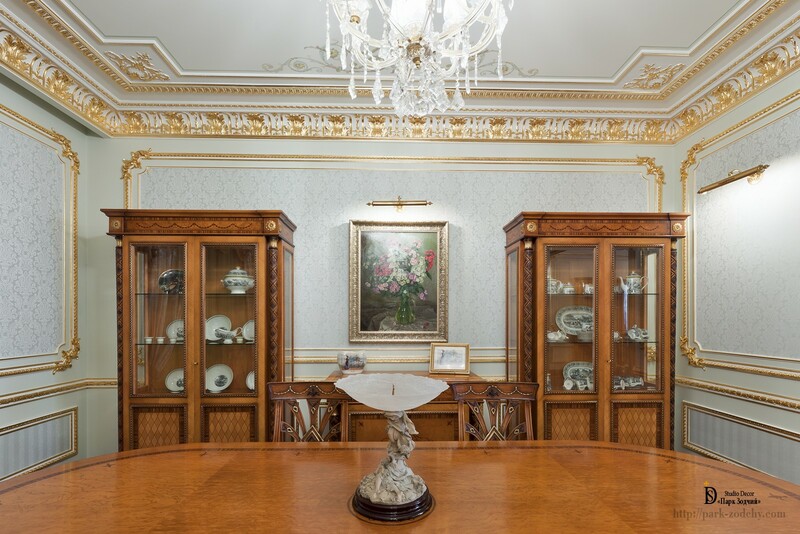 Initially, the designer’s idea was not bad: interesting décor items were used for the dining room: plaster rods, moldings, Classic-style elements, cornice and ornamental painting. However, let's see what was resulted in terms of proper decoration and Interior design, basing on the size of the room. Small height of the room requires specific approaches. For example, horizontal molding and selected wall mirror-like partitioning is appropriate only at large height. In our case, the room looks even lower. Stucco molded mirror is filled in with wallpaper with different designs, so that it has even more crushed the airspace. In this room, it was necessary to arrange floor-length mirror, thus slightly levelling up the height. Corners are not proportional, stylistically breaking out the selected image. Furniture arrangement does not correspond to the wall decoration. The cornice is too large and bright for such room, that is rather a disadvantage than advantage. As a result, the ceiling is overloaded with the abundance of gold. Other interior items are lost on its background. In case of considering this option, we will see a slightly different approach. In fact, “facades of Classic-style buildings” with many architectural elements, which filled the kitchen with theatre decorations have been erected in small area. Rectangular divided glazing on the door, pilasters with capitals, volutes, mini architectural mirrors, gilded frieze, mosaic panel, likeness of the arcaded frieze: almost the entire set, specific for buildings in the Classic style. Perhaps, it is not bad, if not taking into account the size of the kitchen-dining room. Despite the efforts of professional craftsmen: subtly done stucco moldings, its drawing in with gilding, exquisite decoration of furniture elements, in general, the composition selected by the designer has made the Interior quite cumbersome. But the customer’s wishes have been fulfilled. Despite the advice of professional craftsmen in matters of proper Classic-style decoration, the wish of the young designer, though may not be very experienced, was made perfectly. 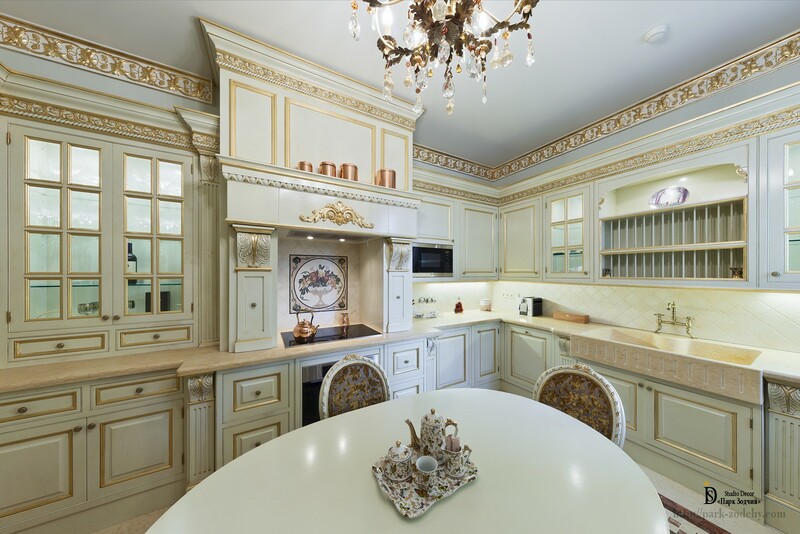 The craftsmen had performed stucco moldings with an interesting pattern, its installation was organized and qualitatively executed, flawless gilding of stucco moldings had been performed.